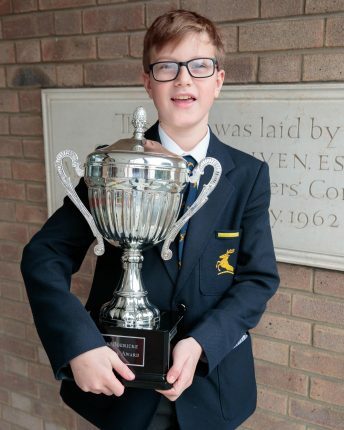 A Y7 pupil has been awarded the Jack Boericke Trophy at the British Triathlon London Region Awards. The prize is presented to a young London-based athlete who has achieved something exceptional in triathlon. Colfe’s pupil Matthew was nominated by his club, the Greenwich Titans, following a race earlier this year where he showed determination to succeed even in the most challenging of circumstances. During an important regional series triathlon, Matthew suffered a catastrophic mechanical failure at the beginning of the bike leg when his pedal came off. Rather than conceding defeat, he shouldered his bike and ran 800m up-hill. At the top he got back on his bike and pedalled one-legged around the course until he came to the bottom of the hill, where he again put his bike on his shoulder and started running. Despite losing so much time, Matthew still completed the course finishing in 28th.